Suburban Essex County Real Estate Ads  great schools, wonderful atmosphere and only 37 minutes by train to NYC! IN the period before the American Revolution, Queen Anne had granted the land to Nicholas and Thomas Parsil, who built a house on it in 1709. Documents from those early days describe the tracts on which the early mill stood as stretching from "the foot of Squaw Hill to the Button Ball Tree to the White Oak." Some of the ancient sycamores still on the land and along Rum Creek could be offspring of those same trees. 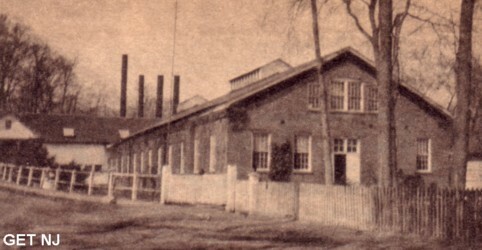 With the guidance of the late Henry D. Scudder, Newark architect, the long task of recreating the old mill in the image of a theater was started. The work continued for four years, from 1934 to 1938, when the doors were opened and the New- ark Art Theater had its new home in full operation. Trees that were seedlings at the time now have reached respectable heights. Parking facilities have expanded. The second floor foyer offers a constant stream of art exhibits, carrying out the founders' aim of developing other arts along with the complex skills of the theater. Additional balcony seats and air-conditioning have enlarged and improved the theater. Meanwhile, some vestiges of the original mill still remain, in addition to the sturdy, three-foot walls and general structure. There is, for instance, part of the huge old sluiceway for the mill's power, now hidden in the foundation. One of the crossbeams of the mill can be seen as the lintel over the immense fireplace in the main lobby. For those who have been attending Paper Mill presentations with any regularity, it is quite possible that the days of light opera and operetta were in some ways the most satisfying. The playhouse was thronged nightly with eager crowds listening to the beautiful songs of Romberg, Friml, Victor Herbert, Lehar, Cole Porter and Gilbert and Sullivan. NOW that the public taste has veered away from this sort of thing, it is interesting to speculate on reasons for the change. One thing is certain-good voices were popular then. A whole new generation of excellent and skillful ingenues came along -Dorothy Kirsten, Dorothy Sandlin, Gail Manners and Andzia Kuzak to name a few. The soubrettes, like Yolanda Lupachini, also were great. These were real singers, not the talking types one often finds today, or the belters who have great voices if the sound engineer is merciful. The operetta-musical comedy sort of entertainment called forth some other assets as well. Donald Gage's lyric tenor was always useful in "Desert Song" and the late Harold Patrick contributed his vast presence to many heroic roles. There were many others who are lost in time, as well as lively comics who played various valets, butlers, schoolmasters and the like. And it was widely conceded that the Paper Mill choruses were of absolutely top quaities in range, training, stage deportment and part-singing skill. A whole new generation of musical offerings has arrived which might easily be called non-musicals, so different are they from the commonly accepted sort of play-with-music. "The Pajama Game," "Damn Yankees," "Guys and Dolls," "Brigadoon" and "Plain and Fancy" did not need the large, opera-trained voices, and so the voices vanished. But the great musical works of the early 20th century had fulfilled their purpose admirably. The Paper Mill had served, without design, as a kind of revival place for great musical comedy. From it came the inspiration for numerous other-showplaces to produce similar works, as word of Paper Mill's success spread. The Mill staff will tell you privately of several famous places which inquired into ways and means of duplicating that success. The tent shows, the municipal operas of here and there, the operetta circuit that traveled about to many expositions  all of them came in some way or other from Paper Mill. 1920 photo shows mill as it looked before renovation as nationally famous theater.